I woke up early this morning and did a little reading for pleasure before taking the bike out to the Marigny for blueberry pancakes with V. and a quick tour of her place for my upcoming housesitting/squatting gig. It was bright and hot out, and the streets had that empty feeling they have on Sunday mornings when everybody who’d be up and out on a Sunday is in church and everybody else is still in bed. I rode down Bourbon Street where folks tried in vain to wash out the smell of a hot summer weekend; it’s a special stench you have to smell to understand. After brunch I rode out St. Claude to just get some smooth pedaling in–that bike lane never gets old–and then headed to Mid-City to meet M. for a study date. I took a similar route home from last night’s to see how things are looking in the daytime. 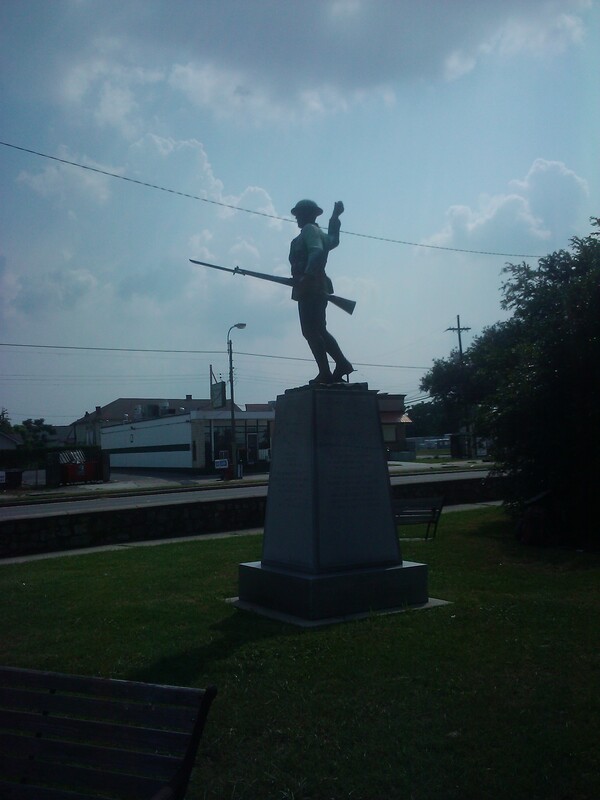 I stopped at the light at Galvez and Tulane and snapped a picture of this statue commemorating soldiers from World War I. The base of the statue is covered in light blue graffiti, and two of the four benches surrounding the thing are broken down, appearing to have buckled in the heat, though I’m sure that’s not the case. A man was sleeping in the shade provided by the bush behind the statue, but other than that, the area was empty. It reminded me of the book I started my day with, and the complicated nature of remembering: Confederate veteran Carleton McCarthy “observed how the civil War possessed the American imagination by the 1880s. ‘A real good hearty war like that dies hard. No country likes to part with a good earnest war. It likes to talk about the war, write its history, fight its battles over and over again, and build monument after monument to commemorate its glories'” (Chapter 6). Comparing this to the ever-expanding WWII Museum a mile or so toward the river, it seems clear some wars are heartier than others. I pedaled home, sweating that good summertime sweat; I’m used to it again, thank goodness. This entry was posted in history and tagged Marigny, Mid City, New Orleans, statues, World War I. Bookmark the permalink.